Greening in the Translational Biophotonics & Imaging Lab. Gage Greening is a PhD student in the Biomedical Engineering Department at the University of Arkansas. 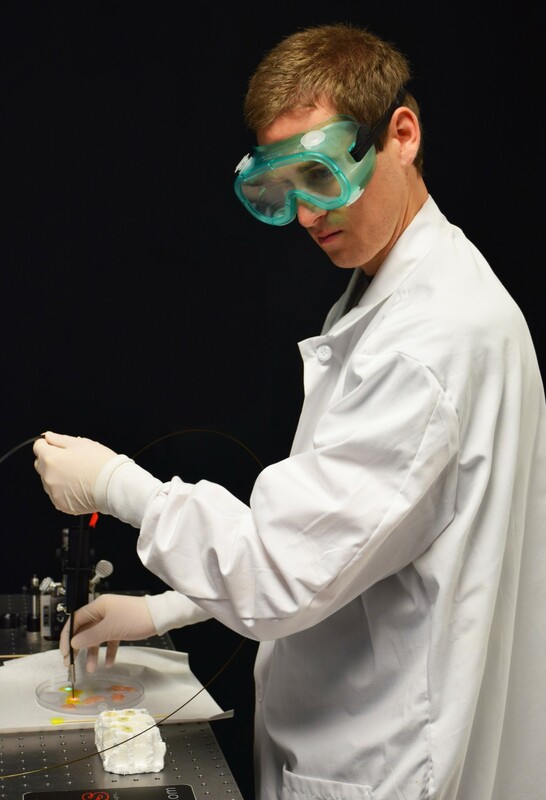 He is part of the research team in Dr. Timothy Muldoon‘s Translational Biophotonics & Imaging Lab. UArk BME: You mentioned in a 2014 piece in A+, the Honors College magazine, that you’ve, “always had a diverse set of interests, including the life sciences, math, athletics, and art, especially sketching and filmmaking.” How does being a biomedical engineer allow you to tap into some of these passions? Greening: I think biomedical engineers need to have a diverse set of interests and skills to be successful. 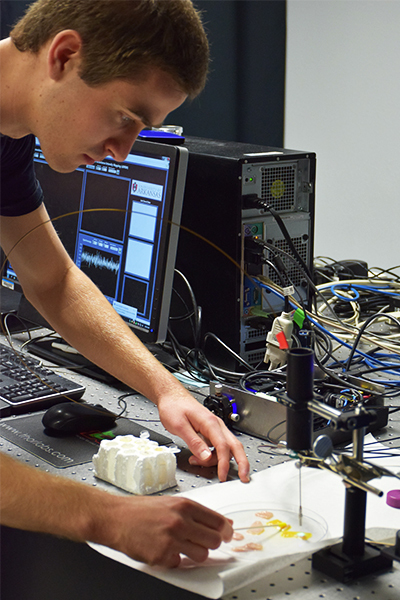 Biomedical engineering requires a combination of skills to think about medical problems in new ways. An understanding of life science is vital to knowing which problems are worth spending time to solve. Art and sketching are important for visually communicating with your colleagues through engineering sketches. In the design phase, design sketches are an engineer’s best friend. Math, logic, engineering, programming, and troubleshooting all come into play in my research. Seeing your finished project and presenting this project through conferences, presentations, or publications is tremendously satisfying because of all the hard work that goes into it. The many phases of a biomedical engineering research project encompass many of my passions, and that’s why I love going to work each day. UArk BME: As a biomedical engineer, how have your goals changed over time? Is the research you’re doing now what you first set out intending to work on? Greening: I started college wanting to go to medical school. I chose to major in biomedical engineering as a pre-medical degree, but as I progressed through school, I asked myself, “What do I want to do? Be on the front lines of medicine, using new devices and techniques created by engineers? Or do I want to be ‘behind-scenes’ creating new devices and techniques for doctors?” After deliberation, I changed my original goal and chose the engineering route. What’s so great about a biomedical engineering degree is the freedom to choose what side of medicine to be on depending on personality and passion. We need doctors. We need engineers. Everyone must come together to improve human health and medicine. Furthermore, I didn’t know I wanted to work in an optics and imaging lab. But I’m a very visual person and after getting my foot in the door with Dr. Muldoon’s lab, I fell in love with it and continued my graduate studies in this lab. UArk BME: Last year, your research work was published in the Journal of Biomedical Optics, a leading publication in the field. Could you explain in more detail what your paper, “Characterization of thin poly(dimethylsiloxane)-based tissue-simulating phantoms with tunable reduced scattering and absorption coefficients at visible and near-infrared wavelengths” explored? Greening: This paper explored a technique we developed to create tissue-simulating “phantoms”, which are false-tissues. Often times, researchers want to test or calibrate new equipment using false-tissue before using living tissue. This paper explored a new technique to create tissue-simulating phantoms that closely match the optical and geometric properties of real human tissue. We hoped these phantoms could be used by researchers across the world for their own research projects. Several months after we published our paper, Duke University contacted us and was interested in using our phantom design to test an implantable device to track the progression of breast cancer. In addition, we just published a second paper on November 19, 2015. This paper explores an imaging and spectroscopy device we hope can be used to qualitatively and quantitatively track tissue health over time. 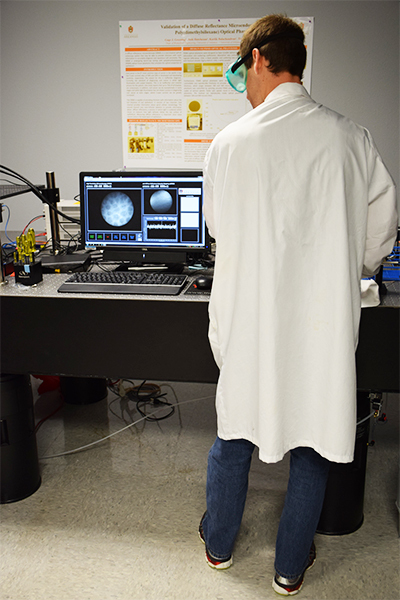 We tested our device in mouse tissue, human tissue, and tissue-simulating phantoms. One particular experiment uses the phantoms we built in our first paper. Through these two publications, I learned how research builds on top of previous research. It’s satisfying to see this progression. Next, we just published an eBook as part of the SPIE Spotlights series. This eBook describes the further developments, improvements, and modifications to our technique from our first paper and also reviews many other publications that used tissue-simulating phantoms for their biomedical optics-related instrumentation. UArk BME: What’s the next step in your research? Greening: Right now, we are interested in elucidating the link between structural (anatomical) and functional (biochemical) characteristics for healthy and diseased epithelial tissue. To do this, we use a contact-based, fiber-bundle probe to co-register images of tissue microarchitecture with clinically relevant indicators of tissue health including hemoglobin concentration and oxygen saturation, which can potentially be used as reports of tumor response to therapy or as indicators of local vascularization and angiogenesis. I would like to package this device into a portable system that we can take to hospitals and clinical settings within one year. 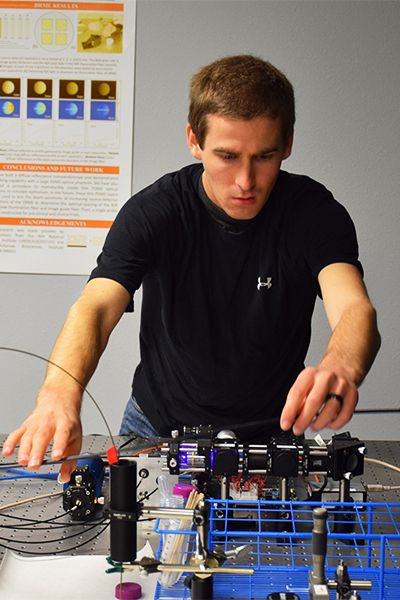 UArk BME: Last year, you had the chance to present some of your research work at the 2015 SPIE Photonics West Conference in San Francisco. Looking back on the Conference, what stands out? Did anything surprise you about the experience? Greening: The amount of people stands out. The SPIE Photonics West conference is one of the largest conferences for biomedical optics. I had the chance to meet investigators across the country and listen to great research presentations on a variety of topics. Some of the presentations even gave me new ideas for my own research project. These conferences help introduce you to researchers across the world and give you a new perspective on how your research fits into the big picture of biomedical engineering. It was a very immersive experience and I hope to have many more like it. During the day I presented, I spent a lot of time practicing my presentation in my hotel room since it was my first major research presentation. The presentation was at the end of the day, so there was a lot of time for my nerves to build up, but everything went really well and it gave me a lot of confidence for my next conference. Additionally, I was able to take a day off and explore San Francisco. I got to see the Golden Gate Bridge, Alcatraz, AT&T Park (Giants baseball stadium), Fisherman’s Wharf, and the Ghirardelli factory. UArk BME: What’s it been like to work with Dr. Timothy Muldoon (the principal investigator of the Translational Biophotonics and Imaging Lab)? In what ways has he helped you in your research/career? Greening: Dr. Timothy Muldoon is an excellent mentor. He allows me and his other graduate students to work on our own, make our own mistakes, develop as engineering, while at the same time being readily involved with our research. The best way I can describe his approach is “guided freedom,” and this creates a trusting environment. Secondly, he understands the fact that all his students have a diverse set of career goals and does his best to expose us to prominent members of our scientific community, whether that be through conferences, research collaborations, or publications. He always encourages me to continue my hard work. UArk BME: More broadly speaking, what makes being a biomedical engineering student at the U. of A. different than being one elsewhere? What sets this program apart? Greening: First, being a new department is unique. After joining the Translational Biophotonics and Imaging Laboratory four years ago as an undergraduate, I had the chance to help build a biomedical optics lab instead of just being thrust into an already established lab. The medical devices my lab mates and I are building are the first optics devices built in this lab, and hopefully, long after I’m gone, new graduate students will come in and use and improve upon work we’ve accomplished so far. This has definitely been challenging, but’s it’s exciting to be part of this growth period. After hiring new faculty members, many more students will have these same opportunities to experience the growth phases of a new laboratory. Secondly, our department is the only one in Arkansas and one of the only ones in the southern Midwest region, meaning recruitment reaches a larger geographical scope. Our faculty members are excellent. They’re intelligent, helpful, and push their students to be the best they can be. Because of this, I think our department attracts many intelligent and highly motivated students in the state and surrounding areas (I came from Missouri, and my colleagues in my lab came from Oklahoma, Tennessee, and New York). All of the professors bring in experience from established biomedical engineering labs across the country. So, they have gotten the opportunity to mold the department in the best collaborative vision they have. Our professors were educated at laboratories from Rice and Columbia (Muldoon), Texas and Duke (Rajaram), Pennsylvania and Tufts (Quinn), and Georgia Tech and Harvard (Balachandran), etc. Our professors model their labs and department on their experience from these established programs. The best way I can describe the status of our department is new and young, with influence from the well-known. For this reason, the students, faculty, and staff all have a unique opportunity to help make the biomedical engineering department at the University of Arkansas an even more terrific program. UArk BME: What’s the hardest part of being a biomedical engineer? How do you manage it? Greening: There are different phases to a research project. There’s the initial brainstorming stage to meet design requirements. Then there’s the phase where you actually have to build/run experiments. This is a frustrating process because it requires all the math, engineering, programming, and science learned in school (and a lot you didn’t learn in school). Often times, I go through days or weeks of running into dead ends without making noticeable progress. But then one day, you find an opening. And you realize all the dead ends were a necessary learning process. I often think, “If only I would have thought of this sooner, or done this sooner, or did the experiment right the first time!” But then I realize all of these obstacles were necessary for professional growth. And the moment you make the breakthrough in your project, it’s all the more satisfying. This is all before you run into the NEXT dead end, and the process repeats itself. All the dead ends and setbacks are hard to deal with, but the drive to succeed always overrides the frustration. The other thing that’s hard is verbally communicating research ideas and results. I think this is common among biomedical engineers. We often have elaborate ideas in our heads on how we want to solve a problem, but articulating this design may not come very easily. I manage this problem through direct practice. I’m always practicing articulating my research through our weekly lab meetings, through collaboration with colleagues, or through large conferences where you must present your research to possibly 100’s of people. Communicating research is a vital skill to have, and this comes with practice. UArk BME: Any advice for students thinking of studying biomedicaleEngineering, at either the undergraduate or graduate level? Greening: Make sure you want to be a biomedical engineer for you and not because it’s an impressive buzzword major. Get in contact with current students (graduate and undergraduate) via email and ask to meet them to discuss the department. You’ll learn the most this way. If you are a high school student considering biomedical engineering, contact a graduate student to give you a tour of all the biomedical research labs and facilities you would potentially be working in in addition to your standard university tour. If you are a potential graduate student, do the same. We’re all friendly people who want to help you! Join the Honors College and join a research lab as early as freshman year. There’s a lot of turnover in labs at the undergraduate level, so keep kindly contacting your professors regarding openings. From a graduate student perspective, we love undergraduates who are independent and enthusiastic. 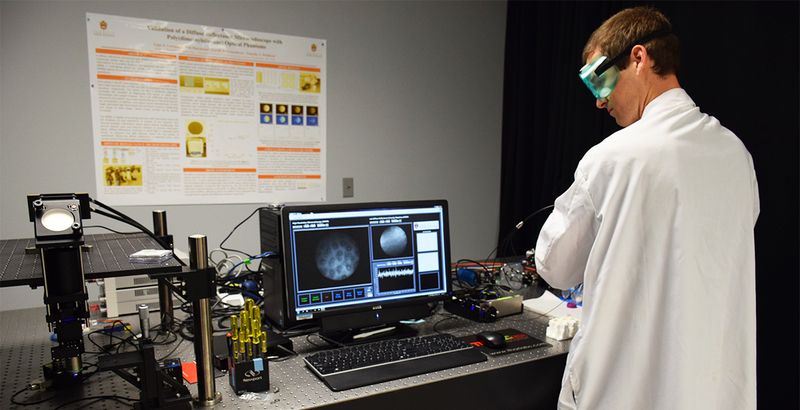 The University of Arkansas has the only biomedical engineering department in the state and one of the only ones in the southern Midwest, so there is ample opportunity to help build our growing department into a regional research powerhouse. Once you graduate, keep in mind the possibility of relocating to coastal or large metropolitan areas, where the major biomedical engineering industry hubs are located. UArk BME: A Biomedical Engineer learns he is going to be stranded on a deserted island, and will be allowed to bring only three items with him. What does he bring? Greening: A deserted island seems like a fun and challenging opportunity…to be part of this unexplored environment. There’s so much potential and I wouldn’t want to leave right away. Instead of getting back to society, why not create a better society on the island? First, I’d want to bring my wife. Secondly, I’d want a suitcase to store engineering and survival books. Having a library of books would allow me to keep learning and (try to) build environmentally friendly technology on the island. I could make the island inhabitable for humans without disturbing the natural wildlife and create a hub to progress medical and environmental technology. I think I may have cheated with this one though. Finally, I’d bring a scrapbook and pen with everlasting pages and ink. This would be used for many things including thoughts, brainstorming ideas, artwork, engineering sketches, etc.